The effect that over-production, since the War, had on the farming community was rather like engaging reverse gear when going fast-forward. Except for some cereals, no commodity was ever over produced for home consumption here, but by joining the European Union, we shared their surpluses. The existing system had been changed. All this in a world where half the population were starving. The farming difficulties were also compounded by the outbreaks of BSE (Bovine Spongiform Encephalitis) and Foot & Mouth disease . Winsham farming is changing. For the connoisseur it takes about ten minutes in a light aircraft out of Dunkeswell Airfield (Honiton) and flying at above 500 ft. to circle the boundaries and bisect the whole Parish of Winsham. 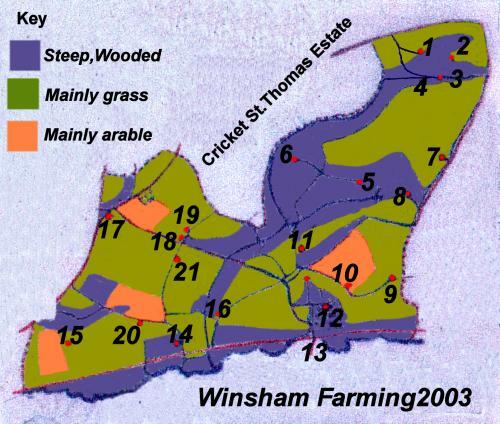 Winsham is clearly seen as a Parish of small fields (few above twenty acres) and even fewer that are really flat. Woodland (copses, coppices, spinneys, woods, covers and hummocks) are richly sprinkled over the undulating landscape indicating its parkland and sporting origins. and the small mixed enterprise policy which formed its farming base. To try to ease matters and preserve the ethics and viability of the countryside the Government has now introduced subsidies for 'Set Aside' (unused) land and 'Stewardship' (pro wildlife) policies. There is also limited help to set up 'organic' farming and 'farm shops'. Many believe that not being near a city or on a high-grade soil these changes are not feasible at the moment. Indeed diversification usually requires much extra capital. Many facilities are already offered on the Cricket Estate. Even there, three out of four dairy herds have closed down. Many farms have now given up dairying in favour of grazing (sheep, young stock, bullocks, horses) and baled silage. Farms are splitting or getting larger and young people - workers or sons - are becoming a rarity. Villagers this year are missing the baby lambs that are usually born in the mid village small fields. Winsham is a prize-winning village of dynamism and change. Its farmers are ever optimists for a healthy agriculture that is the basis of a beautiful countryside. .